The Winnipeg General Strike of 1919 was one of the most influential strikes in Canadian history, and became the platform for future labour reforms. Massive unemployment and inflation, dismal wages and working conditions, and the success of the Russian Revolution all contributed to labour unrest at the time. Labour leaders from across Western Canada met to form "One Big Union." Negotiations broke down between management and labour in the building and metal trades in May of that year and a general strike was called. At stake were the principle of collective bargaining, better wages and the improvement of working conditions. Within hours almost 30,000 workers had left their jobs. Even essential public employees such as firefighters went on strike. Opposition to the strike was organized by the Citizen's Committee that was formed shortly after the strike began by Winnipeg's most influential citizens. The committee declared the strike a revolutionary conspiracy led by a small group of "alien scum." Never have the workers of Winnipeg had so much confidence in their cause as today. Never has there been such unanimity as to absolute necessity of settling once [and] for all the two points at issue, namely: 1. The right to collective bargaining, and 2. The right to a living wage. The Mounted Police charging down Main Street during the Winnipeg Strike, June 21, 1919. Fearing that the strike would spread to other cities, the federal government sent two cabinet ministers to intervene. The ministers met with the Citizen's Committee but not with the strike committee. On the advice of the cabinet ministers, the federal government ordered its federal employees back to work or face immediate dismissal and on June 17 ordered the arrest of ten strike leaders. Four days later, about 25,000 strikers assembled for a demonstration. The Winnipeg mayor read the Riot Act and called in the Royal Northwest Mounted Police who rode in on horseback charging into the crowd of strikers, beating them with clubs and firing weapons. This day, known as "Bloody Saturday," ended with federal troops occupying the city's streets. 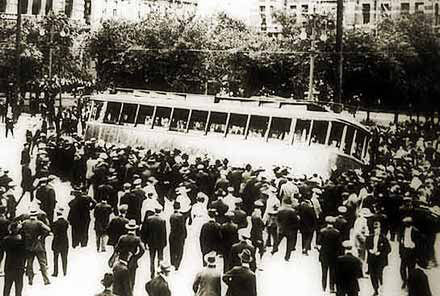 Faced with the combined forces of the government and the employers, the strikers decided to return to work on June 25. The General Strike left a legacy of bitterness and controversy with a wave of increased unionism and militancy across Canada. J.S. Woodsworth, a strike leader who was sentenced to one year in jail, eventually went on to found the Co-operative Commonwealth Federation, which was the forerunner of the New Democratic Party. Almost three decades passed before Canadian workers secured union recognition and collective bargaining.